Ten Speed Press, 9780399581274, 208pp. 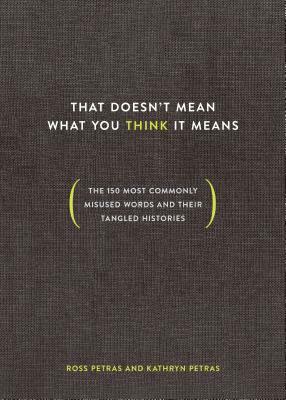 An entertaining and informative guide to the most common 150 words even smart people use incorrectly, along with pithy forays into their fascinating etymologies and tangled histories of use and misuse. Even the most erudite among us use words like apocryphal, facetious, ironic, meteorite, moot, redundant, and unique incorrectly every day. Don’t be one of them. Using examples of misuse from leading newspapers, prominent public figures and famous writers, among others, language gurus Ross Petras and Kathryn Petras explain how to avoid these perilous pitfalls in the English language. Each entry also includes short histories of how and why these mistake have happened, some of the (often surprisingly nasty) debates about which uses are (and are not) mistakes, and finally, how to use these words correctly … or why to not use them at all. By the end of this book, every literati will be able to confidently, casually, and correctly toss in an “a priori” or a “limns” without hesitation. Kathryn Petras & Ross Petras, a sister-and-brother writing team, are the authors of many non-fiction books including the New York Times bestseller You’re Saying It Wrong, and compilers of the bestselling page-a-day calendar The 365 Stupidest Things Ever Said (with over 4.8 million copies sold) and its counterpart The 365 Smartest Things Ever Said. Their work has received the attention of, or has been featured in, diverse media outlets including the New York Times, the Chicago Tribune, the Wall Street Journal, Cosmopolitan, the Washington Post, the Huffington Post, Bustle, The Atlantic, the London Times, and McSweeney’s. They have also been guests on hundreds of radio and tv shows, including Good Morning America, CNN, Fox & Friends, and NPR’s Here and Now. They are currently working on a podcast for NPR affiliate KMUW entitled You’re Saying It Wrong. "[Contains] instructions ostensibly designed to make pronunciation a forte. (It's pronounced "fort," by the way.) And designed, too, to spare you the particular strain of embarrassment that results when you learn that you have been pretentiously mispronouncing the name of your already-pretentious sparkling water. You're Saying It Wrong acknowledges that most modern of problems: the fact that so many of us learn words not by hearing them, but by reading them."